Call the park at (520) 628-5798 with questions or to make reservations. Reservations are required. Reservations will only be accepted no later than one day prior to the date being reserved and no earlier than 365 days in advance. A reservation fee of $5.00 per site is required, and is non-refundable. A facility use fee of $15.00/segment (5 a.m. - noon and/or 2 - 10 p.m.) is required at the time of the reservation. If the reservation is canceled more than 60 days in advance, the user fees are refundable. If the reservation is canceled less than 60 days in advance, the user fees are forfeited. 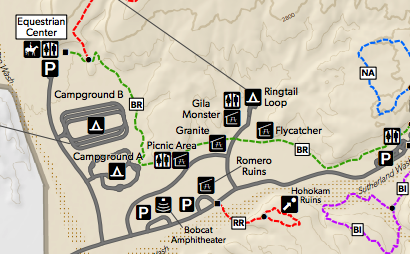 Camping ($15/night/vehicle) and Day Use ($7/vehicle) fees are paid on arrival. Day Use hours are from 5 a.m. to 10 p.m.
Ringtail is not available as a group area from January 1 - March 31. Clean up area after use. Responsibility of the fire pit is taken when the area is reserved. The solar lights are on timer and will not work until dark. Citizens for Solar and the Solar Guild of Tucson, Arizona donated the solar lights. There is no electricity at any area. The second vehicle fee can be paid with your reservation or at the park. Catalina State Park sits at the base of the majestic Santa Catalina Mountains. The park is a haven for desert plants and wildlife and nearly 5,000 saguaros. The 5,500 acres of foothills, canyons and streams invites camping, picnicking and bird watching — more than 150 species of birds call the park home. The park provides miles of equestrian, birding, hiking, and biking trails which wind through the park and into the Coronado National Forest at elevations near 3,000 feet. The park is located within minutes of the Tucson metropolitan area. This scenic desert park also offers equestrian trails and an equestrian center provides a staging area for trail riders with plenty of trailer parking. Bring along your curiosity and your sense of adventure as you take in the beautiful mountain backdrop, desert wildflowers, cacti and wildlife.